The Trinity Dome is the central and largest dome of the basilica, which is the nation’s preeminent Marian shrine, dedicated to the patroness of the United States, the Blessed Virgin Mary under her title of the Immaculate Conception. 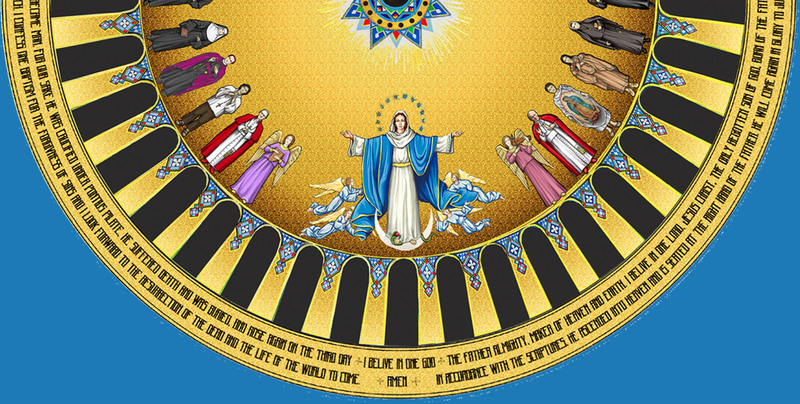 The Trinity Dome mosaic will portray The Most Holy Trinity, the Blessed Virgin Mary, and a procession of saints, all of whom have an association with the United States and the National Shrine. Nearly 100 years ago work began on the Shrine. 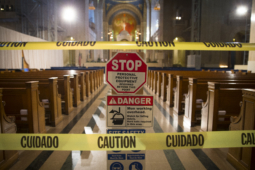 Over the ensuing years, the basilica has embraced a stunning medley of artwork depicting the diversity of cultures and ethnicities represented throughout the United States. The finished mosaic will be the Crowning Jewel of the shrine, exemplifying these numerous cultures and diversity of people served at the basilica. The image gallery reveals the complexity of the mosaic project, the beauty of the artwork displayed, and the history behind the undertaking. Behind the mosaic creation are some of the world’s most talented artists. The process from an artist’s rendering to installing 14 million pieces of Venetian glass in the dome is remarkable. 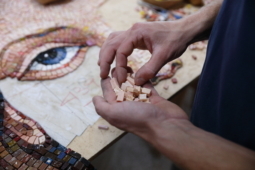 These photos and videos offer a glimpse of the artists working through the centuries-old mosaic process. The engineers and construction crew developed an ingenious, complex scaffolding to hold the artists while protecting the people below. 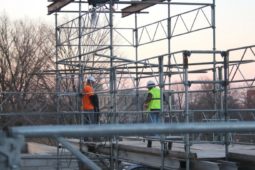 The work on the 18,000-square foot dome would be impossible without this unique, extremely sturdy scaffolding. The photos depict the process, the complexity, and the team making it happen. With the design completed and the mosaic pieces assembled in small sections, the installation of the mosaic begins. Over 14 million pieces of glass are installed in 30,000 different sections to create the magnificent mosaic. The photos and videos highlight the intricate process of installing a mosaic 180 feet above ground. 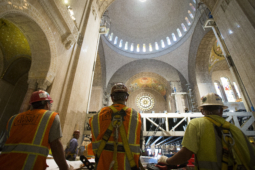 Installing the Trinity Dome mosaic involves many people, including the shrine staff, the Cardinal of Washington, donors and supporters, workers and artisans, and even the Pope himself! Watch as the project progresses.